One of the best parts of our temporary apartment is that we have a pool in our complex that is just begging us to come visit it now that the temps are bouncing into the 80's. 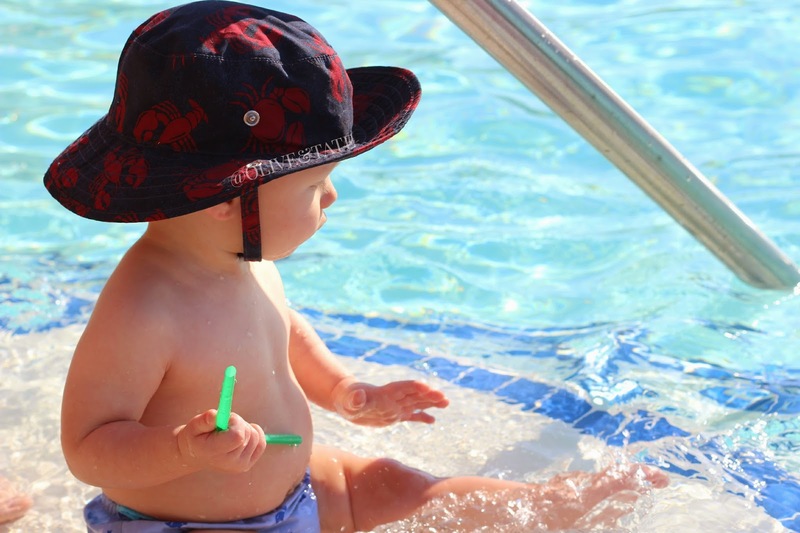 The babe loves the water and we love taking him to splash around in the evenings before the dreaded bed time routine begins. 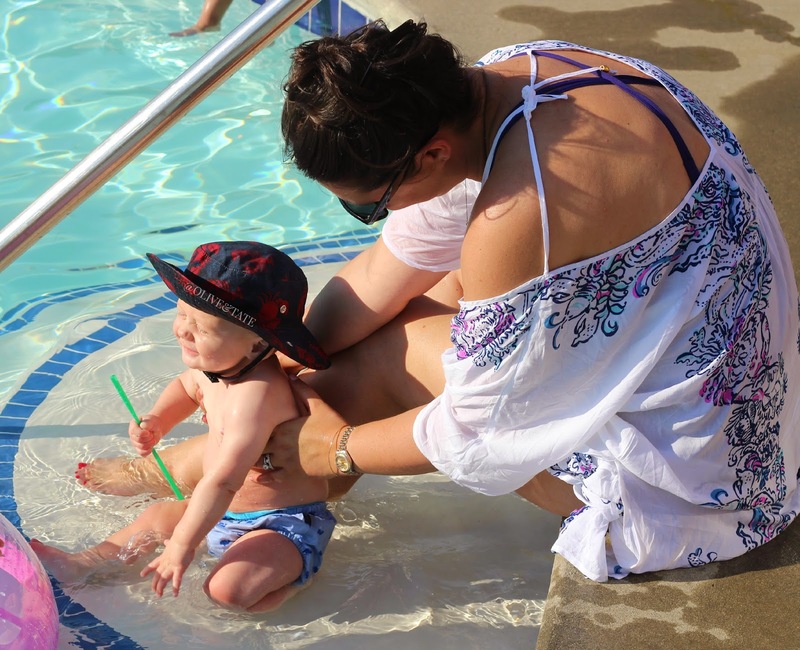 I thought I would round up some of my pool must haves (some from our trips to the local pool and some from our trip to St. Maarten) and share them with ya'll so that you have a shopping list as you hit the pool aisle at Target. My fair baby requires layers of sunscreen and a hat at the mere mention of sun exposure. I love the Carter's Lobster hat in these pictures (which is sadly sold out but this print is just as cute!) because he's reppin' his home state but have also used this sun hat since he was just a few weeks old (the adjustable head area was perfect for his giant newborn noggin). We tried a handful of baby sunscreens during our time in the Islands and I just kept coming back to the Babyganics brand. The texture isn't greasy, it absorbs relatively well and the price is reasonable. I carry it in my diaper bag with me all day, 'err day. 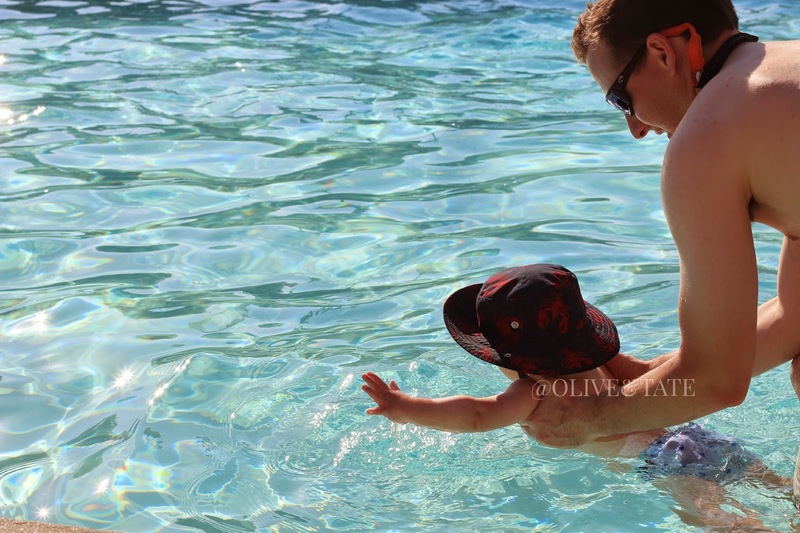 I die for these little swim diapers (and yes, my kid has a death grip on a Starbucks straw in all of these photos). They say you can go sans actual diaper under them but I'm not that brave or into doing laundry. I originally found our first pair on Amazon but Target is carrying the exact same brand now! My fave thing about these little swimmie bottoms is that they come in a super small 0-3 month size, which we needed/rocked on our trip. 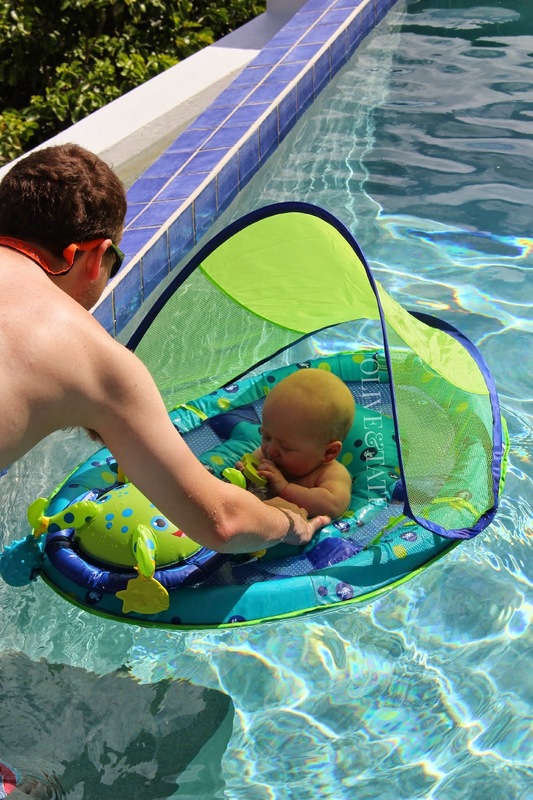 Our go-to floatie device is this baby. It has one million toys, super secure leg supports and a gigantic, adjustable sun shade. It came with us on our trip because it folds up flat and travels oh so well. 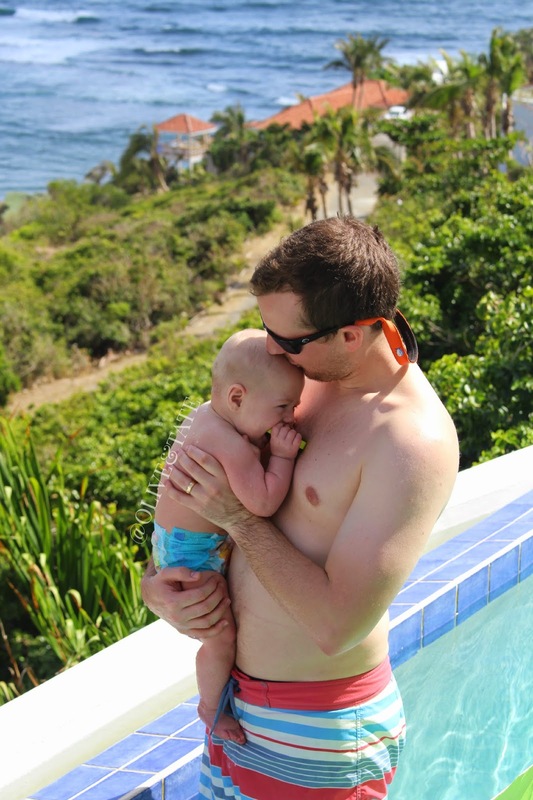 And last, most definitely not least, we use the Huggies brand swim diaper. We've yet to have a major incident and I love that they come with the sides secured so that you can pull them on like a pull up or pull them apart and put them on like a regular diaper. and for Mama, check out this bikini top. I tried it on today and the support is perfect for bigger melons. The thick band can hide at least one weird roll (am I the only one with a fat roll on my back at my bra line? so rogue.) Anyways, the top has a cute faux retro vibe while keeping the ladies in line and still not looking like a grandma. Pair it with a high waisted retro bottom and you're mostly covered but still kinda stylish. Kinda stylish is as high as I aim these days. Other items in my pool bag include: a can of puffs, a sippy with fresh H20, a rash guard (we have this one), a sunscreen stick for quick application and an extra cover up for me. Seasoned mamas, what am I missing? P.S. 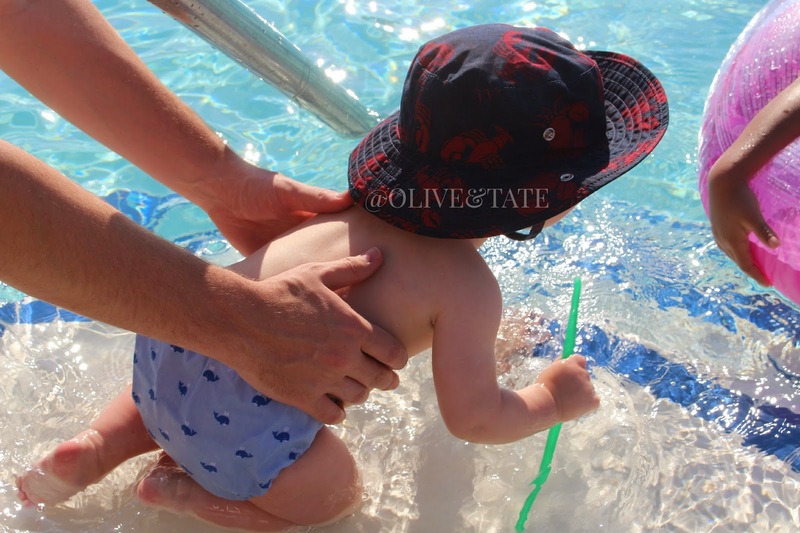 Olive & Tate is now on Facebook! Follow the Facebook page for post updates, pics and Lord knows what else. At least you'll be entertained at work, right?? P.P.S. It seems the name change may have rocked Bloglovin's world. Make sure that you double check that you are still following the Olive & Tate Bloglovin' page if that's you preferred reader! What a gorgeous day for swimming. What sunscreen do you use for Gray? We haven't picked one for Sophie, so she doesn't get much sun exposure. I'm so excited to take R into the pool! He has one of those swim diapers from Target too. Adding that float to my list! Great tips! I love the straw death grip. The whole "the coverup is Lilly for Target so obviously sold out" made me laugh really hard! haha Your little babe is so cute.